Earlier this week, the National Aged Care Alliance, which comprises 52 national organisations, launched the Age Well Campaign, in anticipation of the election and in response to a disappointing Budget week for the sector. Members are urging all candidates in the upcoming election to commit to the necessary policies and funding so that every person in aged care feels supported, whether it be older Australians needing care or aged care workers who are delivering the care. As the largest single grouping of non-government health, aged and community care services across the nation, Catholic Health Australia has joined a raft of leading organisations to endorse the campaign. Catholic Health Australia CEO Suzanne Greenwood said all Australians deserve to age well and with dignity, whether they choose to be at home or in residential aged care. “Australia’s population is ageing and this poses many challenges and opportunities. This includes more pressure being placed on our aged care system than ever before, and as our population continues to age, demands will grow,” she said. Mrs Greenwood said with the Royal Commission into Aged Care Quality and Safety under way, the time was right for the government and sector to work together to future-proof Australia’s aged care system. 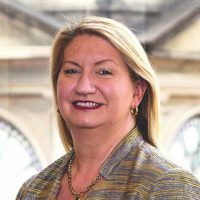 “While the Royal Commission will be instrumental in guiding longer-term reform to ensure sustainable and quality aged care services, government has a responsibility to urgently address the more pressing issues that we need to get right now,” she said. Access by residents of aged care homes to appropriate health services needed to be improved, especially as the population of older people living longer with chronic and complex health conditions increased, Mrs Greenwood said. “In particular, an aged care home is not a self-contained health service. Under Medicare, aged care residents should be able to access health services in the same way as anyone living in the community,” she said. Aged care requires an urgent expansion of in-reach health services so that aged care residents have access to services such as specialist palliative care and mental health services, and allied health, GP and dental health services. “All older people deserve access to the highest quality of care when they need it and where they need it, regardless of who they are, where they live or their circumstances,” Mrs Greenwood said. Ian Yates, head of COTA Australia, said he was “utterly dumbfounded” that in the recent Budget addresses neither the Government nor Opposition allocated any new funds to addressing the 125,000-person-long home care wait list. “The Government and all candidates must stand up and commit to ending the home care waiting list nightmare,” Mr Yates said. “The Counsel Assisting the Royal Commission described the home care waitlist as ‘cruel, unfair, disrespectful and discriminatory against older Australians’ and we completely agree with this statement. As part of the Age Well campaign, NACA has launched a petition calling on Aged Care Minister Ken Wyatt and Shadow Minister Julie Collins to commit to getting aged care right for everyone. Annie Butler, federal secretary of the Australian Nursing & Midwifery Federation, said: “In the context of our ageing population, there has never been a more pressing need to invest in a workforce of highly skilled aged care workers who are enabled to deliver quality aged care. More information about the campaign is available here.